Traditional fracture treatment requires multiple surgical procedures and subsequent hospital visits for follow up. This is an expensive affair, and also requires long waiting times, which makes the process of bone healing more painful. However, the cost incurred during the application of minimally invasive bone growth stimulators is much lesser that the customary fracture treatment without the use of bone growth stimulators. This, in turn, has resulted in the improved adoption rate of bone growth stimulators among prescribers as well as patients. For instance, a study by the National Institute for Health and Clinical Excellence (NICE) indicated that, bone growth stimulators are a safe, effective alternative to surgery, and are cost-effective. Some bone growth stimulator devices are also available on rent, and thus, this is a cost-effective treatment option. Increasing prevalence of patients with one or more co-morbidities, such as degenerative joint diseases, osteoporosis, osteoarthritis, etc., which make the bones brittle and more susceptible to fracture and delayed healing, is expected to be a strong growth driver for the global bone growth simulators market in the coming years. Bone healing in individuals with diabetes, osteoarthritis, etc., is observed to be generally poorer. Also, the bones tend to become brittle with age, which increases the risk of non-union fractures. A non-union fracture is a devastating condition for the old age population. As per a review article published by the Indian Journal of Orthopaedics (IJO) in January 2016, around 10% of the total fracture patients in the world experience nonunion or delayed union. In such a population, the use of bone growth stimulators is recommended. A clear understanding of the mechanism of action behind bone growth stimulator devices has helped researchers identify new indications for bone growth stimulation devices. Bone growth stimulators are now utilized in the sports industry by injured players who seek instant recovery. The growing incidences of sports injuries and fractures are expected to stimulate growth of global bone growth stimulators market. A survey by the U.S. Centre for Disease Control (CDC) states that, the participation of athletes in organised sports is on the ascent. In 2016, out of 30 Mn sports participants in the U.S., around 10.1% experienced fractures, with the forearms, wrists, and lower legs sited as the most frequently fractured body parts. Researchers are studying new applications of bone growth stimulators, such as for the treatment of fractures in fused lumbar spines. For instance, companies such as Smith & Nephew are also pursuing the use of bone growth stimulators in other conditions such as osteoarthritis, disc repair, ulcer healing, etc. Orthofix LLC is evaluating its already approved device, Physio-Stim, for the treatment of osteoarthritis. Expansion of application provides significant opportunities for the growth of bone growth stimulators market. The preference of patients is likely to be more inclined towards bone growth stimulators because of their 20-30 minutes a day treatment time and easy-to-use features that allow for their self-administration at home. Manufacturers of bone growth stimulator devices are undertaking various efforts to provide bone growth stimulators which are more versatile and convenient for patient use. Many manufacturers of bone growth stimulators in the U.S. have redesigned their products to make them more user-friendly. Some of them have launched light-weight, compact, and more ergonomic versions of their devices. Some have introduced devices with rechargeable batteries. In 2017, Orthofix Inc. launched the onTrack mobile application with its next-generation CervicalStim and SpinalSti bone growth stimulators. The app maintains a treatment calendar, daily treatment information, sends reminders, and thus, helps improve patient care. Non-union or delayed union bone fractures are often recommended with traditional physiotherapy, yoga, or Ayurveda treatment options. Many reviews on fracture management are seen to incorrectly classify electrical and ultrasound treatment of bone growth stimulation as contraindications. The business of bone growth stimulators also faces high competition from chiropractors, which serves as the largest alternative medical profession. Impaired or delayed healing could lead to serious issues for patients as well as physicians, as it may necessitate amputation or bone grafting in worst case scenarios. Thus, in many areas, mainly in developing and under-developed countries, traditional approaches of using orthopaedic drugs for bone healing is still recommended, which may lower the use of bone growth stimulators. Customary bone growth stimulator devices are sold directly to patients by independent and highly trained sales representatives of companies. However, companies are now offering their bone growth stimulator products online through e-Commerce partners such as Amazon.com Inc., eBay Inc., etc. These e-Commerce portals help patients have a glance at the characteristics of products, and select a product of required specification. Ultrasound bone growth stimulators and PEMF enable the non-invasive healing of non-unions in bones. Instances such as FDA approvals for the use of low intensity ultrasound stimulators, to ensure treatment with improved accuracy and results as compared to surgeries, in turn, is responsible for making ultrasound growth stimulators a bestseller product technology. Ultrasound bone growth stimulators work on the principle of low sound intensity (1 to 3 milliwatts per square centimetre) for enhancing the process of bone healing, and have been proven to be ideal for diagnostic and treatment purposes, such as improving muscular conditions, reducing joint and muscle disorders, and fracture healing. In 1994, the FDA approved the marketing of the first ultrasound bone growth stimulator for fresh fracture healing. Major players in the bone growth stimulators market focus on launching their products in the regulated and matured markets of the U.S., Europe, and Japan. North America and Western Europe are expected to register the highest market attractiveness indices of 4.0 and 2.2, respectively. This is due to the high demand for bone growth stimulators in the home care sector in the region. In Japan, the highest level of orthopaedic care is available in major cities; besides, a number of fellowship programs and clinical studies on non-union of bones and fracture healing form the basis of the market in the country. Such developments are forecast to propel market growth in the country. The FMI report provides detailed information about the growth parameters of bone growth stimulators market, with the help of a detailed assessment of the competitive environment in the global market. The global market study on bone growth stimulators provides comprehensive data on each stakeholder in the bone growth stimulators market, including DJO LLC., Orthofix International N.V., Zimmer Biomet Holdings Inc., elizur, Bioventus LLC., Ossatec Benelux BV, Verve Consulting Inc., and IGEA S.p.A., among others. The report provides readers with all-encompassing data on each manufacturer’s revenue shares, winning strategies, and latest information on product launches/approvals in the bone growth stimulators market. Mergers and acquisitions are emerging as a prominent trend among key players in the global market. Considering the high growth potential of the bone growth stimulators market, DJO LLC, one of the leaders in the orthobiologics market, acquired parts of the business assets of strong players in the orthopaedics market, such as Zimmer Biomet Holdings Inc. and Speetec Implantate GmbH, and entered into a merger agreement with ReAble Therapeutics, Inc. to fortify its leading market position, and also to expand its global product portfolio. In 2012, the company acquired Exos Corporation, an innovator company in orthopaedic medical devices, and was benefited by combining its technology and service capabilities with those of Exos Corp.
A bone growth stimulator is used for a bio-physical method of bone growth stimulation, which works on the bio-electrical principle of bone healing. Human bones have an inherent capability of heal themselves when injured or broken, by creating an electrical field naturally. Bone growth stimulators are used in cases of delay or failure of fracture healing, as they enhance the bone healing process without the sensation of electrical shocks or currents or vibrations when being worn by a patient. The market study on bone growth stimulators was recently published by FMI, which provides comprehensive information about the most important market dynamics that prove instrumental in the growth of the bone growth stimulators market during 2015-2025. Market players can find the most accurate quantitative and qualitative information about the growth parameters of the bone growth stimulators market in the report, which can help them develop data-driven business strategies in the coming future. For the better understanding of readers, this FMI report provides salient information about the bone growth stimulators market in the most comprehensive manner. The bone growth stimulators market is segmented according to geographical region, product type, application, and end user, to analyze the segment-wise growth of the market. Based on geographical region, the bone growth stimulators market is segmented into seven regions – North America, Latin America, Western Europe, Eastern Europe, Asia Pacific Excluding Japan (APEJ), Japan, and the Middle East & Africa (MEA). The bone growth stimulators market is segmented into three product types, viz., noninvasive electrical bone growth stimulators (further segmented into capacitive coupling devices, pulsed electromagnetic field devices, and combined magnetic field devices) and ultrasound bone growth stimulators. Furthermore, the applications of bone growth stimulator devices include trauma injury & fractures, spinal fusion, and osteogenesis. Based on end user, the global bone growth stimulator devices market is divided into four segments – hospitals (further segmented into <200 beds, 200 to 499 beds, and >500 beds), ambulatory surgical centers, home care settings, and orthopedic clinics. Which device has the highest demand in the bone growth stimulator devices market? How has the global bone growth stimulator devices market evolved over time? Which regulations in various regional segments are influencing the strategies of players in the bone growth stimulator devices market? What is the pricing ranges for different types of devices in each region? The process of market research followed at FMI commences with extensive secondary research of the bone growth stimulator devices market. Analysts obtain industry-validated, historic, and current data about the demand and sales of all approved bone growth stimulator devices across the globe. Comprehensive secondary research is then followed by primary research, where detailed information about the bone growth stimulator devices market is obtained, in terms of value (US$ Mn) and volume (units), Based on thorough secondary and primary research of the growth parameters of the bone growth stimulator devices market, analysts come up with the most precise forecast on how the bone growth stimulator devices market will grow over the forecast period. A recent market study published by Future Market Insights – 'Bone Growth Stimulator Market: Global Industry Analysis and Opportunity Assessment 2015–2025', consists of a comprehensive assessment of the most important market dynamics. The report provides analysis of the bone growth stimulators market at 2014, and forecast of the market over 2015–2025. The report provides emerging trends and opportunities in the global market which can help market players design their manufacturing, product, or business strategies, and exploit the maximum growth potential in the global bone growth stimulator market. The report provides analysis on market dynamics in the most comprehensive way for the better understanding of readers. In the opening section of the global report on the bone growth stimulator market, the executive summary of the report is provided, which includes the global market overview and key findings. The section also includes market value (US$ Mn) estimates for key segments of the global bone growth stimulator s market. This section provides detailed taxonomy and definition of each segment of the global bone growth stimulator s market. The section helps readers understand the scope of the report, inclusion and exclusion criteria for different products within the scope, etc. This section also provides the analysis of the global orthobiologics market, and share of the bone growth stimulator s in it. This chapter provides readers with information about the most important macroeconomic and microeconomic factors that are instrumental in shaping the bone growth stimulator s market. 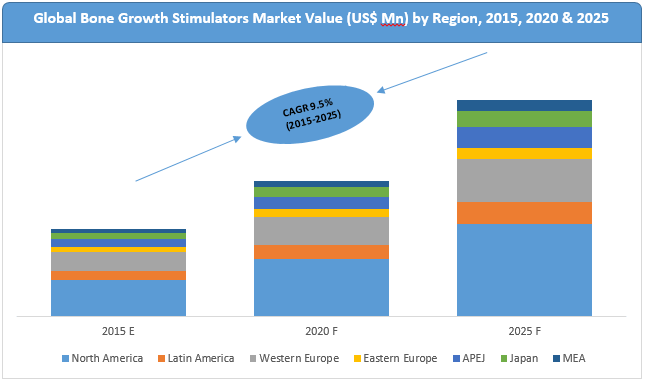 It helps readers understand the critical market dynamics such as drivers, market restraints, trends, and growth opportunities for market players in the bone growth stimulator s market. Based on product type in the bone growth stimulator s market, this section elaborates market value analysis for individual product types, including noninvasive electrical bone growth stimulators (further segmented into capacitive coupling s, pulsed electromagnetic field s, and combined magnetic field s) and ultrasound bone growth stimulators The section explains comparative trend analysis and market attractiveness analysis for each segment. This section provides market size analysis of the bone growth stimulator s market for different applications, including trauma injury & fractures, spinal fusion, and osteogenesis Market attractiveness analysis by indication is provided to understand the effects of application/indication expansion on market size. End user analysis provides analysis on the usage and adoption patterns of bone growth stimulator s across various end users, on a global level. Market attractive analysis by end user is also discussed to fathom the relative lucrativeness of different end users of bone growth stimulator s.
From a geographical perspective, the global bone growth stimulator s market is analysed on a total of seven regions, viz. North America, Latin America, Western Europe, Eastern Europe, Asia Pacific excluding Japan, Japan, and the Middle East and Africa (MEA). Historical trends in the bone growth stimulator s market and their effects on global market performance are discussed in this chapter. Readers can find detailed information about factors such as recent market developments, pricing analysis, and regional trends that are impacting the growth of the North American bone growth stimulator s market. This section also includes the growth prospects of the bone growth stimulator s market in countries such as the U.S., and Canada. The market performance of bone growth stimulator s in Latin America is discussed on a country level (Brazil, Mexico, and the Rest of Latin America) in this section. The section also provides insights on regional market trends in the Latin American bone growth stimulator s market. This section provides country-wise analysis of the bone growth stimulator s market in Western Europe. Countries covered in this section are Germany, Italy, France, U.K, Spain, Nordic Countries, BENELUX, and the Rest of Western Europe. Market attractiveness analysis by country is provided to identify the potential of growth for key players in the bone growth stimulator s market. The section highlights regional market trends and pricing analysis for bone growth stimulator s.
This chapter of the report introduces the bone growth stimulator s market Russia, Poland, and the Rest of Eastern Europe, by providing detailed information about the growth avenues for market players in the region, and the growth prospects of the market based on its leading segments. China, India, ASEAN, and Australia & New Zealand are the leading countries in the APEJ region, which are the prime subject of assessment to obtain the growth prospects of the APEJ bone growth stimulator s market, in this chapter. Readers can find thorough information about the growth parameters of the APEJ bone growth stimulator s market during the period 2015–2025. Readers can find important factors that can make a huge impact on the growth of the bone growth stimulator s market in Japan This chapter provides an overview of pricing, drivers, restraints, and trends in the Japanese bone growth stimulator s market. This chapter provides information on how the bone growth stimulator s market will grow in major countries in the MEA region, such as GCC Countries, South Africa, and the Rest of MEA, during the period 2015-2025. This section provides a dashboard review of competition in the global bone growth stimulator s market. It details the comparative assessment of key products specific to market segments, and the competitive position of key players in the global market. Readers can find a comprehensive profiles of key players in the bone growth stimulator s market, including company overview, revenue shares, strategic overview, recent company developments, SWOT analysis, etc. Market players featured in the report include DJO LLC., Orthofix International N.V., Zimmer Biomet Holdings Inc., elizur, Bioventus LLC., Ossatec Benelux BV, Verve Consulting Inc., and IGEA S.p.A., among others. This section helps readers understand the research methodology followed to obtain various conclusions, important qualitative information, and quantitative information about the bone growth stimulator s market.